On the 1st (Tue), admire the local landmark of Plaza de Cibeles and then make a trip to Puerta del Sol. On the 2nd (Wed), you'll have a packed day of sightseeing: explore the activities along Retiro Park, examine the collection at Prado National Museum, and then admire the masterpieces at Museo Nacional Centro de Arte Reina Sofia. Cairo, Egypt to Madrid is an approximately 7.5-hour flight. You can also drive. The time zone changes from Eastern European Time (EET) to Central European Time (CET), which is usually a -1 hour difference. Traveling from Cairo in January, things will get a bit cooler in Madrid: highs are around 12°C and lows about 2°C. Wrap up your sightseeing on the 3rd (Thu) to allow time to take a train to Ronda. On the 4th (Fri), learn about winemaking at Bodega Garcia Hidalgo, learn about winemaking at Dona Felisa Winery, get great views at Mirador de Aldehuela, then take in breathtaking views at El Tajo de Ronda, and finally contemplate the long history of Puente Viejo. Here are some ideas for day two: explore the stunning scenery at SierrAventura Ronda, snap pictures at Puente Nuevo, and then take some stellar pictures from Mirador de los Viajeros Romanticos. For reviews, maps, photos, and tourist information, go to the Ronda online trip itinerary maker . Traveling by train from Madrid to Ronda takes 4 hours. Alternatively, you can do a combination of flight and train; or drive. When traveling from Madrid in January, plan for somewhat warmer days and about the same nights in Ronda: temperatures range from 18°C by day to 5°C at night. Wrap up your sightseeing on the 5th (Sat) early enough to drive to Seville. 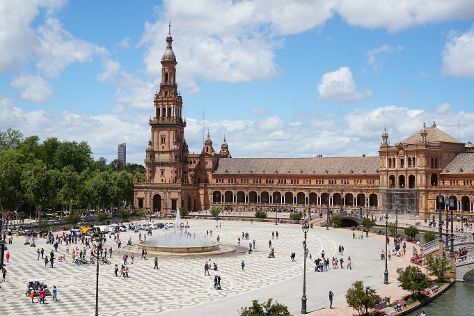 Kick off your visit on the 6th (Sun): tour the pleasant surroundings at Royal Alcázar of Seville, then awaken your taste buds at some of the top wineries in the area, and then admire the striking features of Plaza de Espana. Get ready for a full day of sightseeing on the 7th (Mon): make a trip to Metropol Parasol, don't miss a visit to Plaza de San Francisco, then take a stroll through Barrio Santa Cruz, then take in panoramic vistas at Torre Giralda, and finally take some stellar pictures from Seville Cathedral. To find traveler tips, other places to visit, maps, and more tourist information, refer to the Seville online vacation planner . You can drive from Ronda to Seville in 2 hours. Alternatively, you can take a bus; or take a train. In January, daytime highs in Seville are 17°C, while nighttime lows are 7°C. Wrap up your sightseeing on the 7th (Mon) early enough to travel to Barcelona. Barcelona is known for parks, nightlife, museums, shopping, and fun & games. Your plan includes some of its best attractions: pause for some serene contemplation at Basilica of the Sagrada Familia, pause for some photo ops at Casa Batllo, get to know the fascinating history of El Barri Gòtic, and admire all the interesting features of Camp Nou. Inspirock's itinerary builder makes planning a Barcelona trip simple and quick. You can fly from Seville to Barcelona in 3.5 hours. Other options are to take a train; or drive. In January, plan for daily highs up to 17°C, and evening lows to 7°C. Finish up your sightseeing early on the 10th (Thu) so you can travel back home.